The Cattier Organic Repairing Mask nourishes and deeply repairs dry ends. Its rich and creamy formula enriched with butter and Cupuaçu Marrow Organic Bamboo, the hair fiber sheath to facilitate easy combing. With Repairing Mask for Dry Hair Cattier, it prevents the formation of forks and intensely protects your hair. They are stronger, soft and silky! 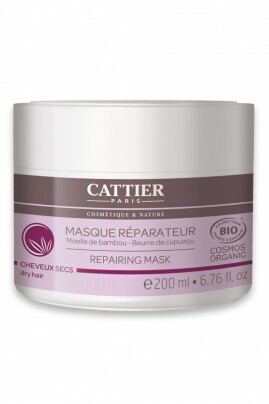 Fix your hair dry with the Masque Bio Cattier Repair! After your Cattier Organic Shampoo, apply Bio Hair Repair Masque CATTIER on hair rinsed and drained, distributing strand by strand to ends. Leave on for 5 to 10 minutes before rinsing for best results and for stronger hair!